Here is a list of best free video filter software for Windows. Using these software, you can add filters of various types and shades to your videos. You can find various types of predefined filters along with features to make custom filters in some software. In terms of predefined filters, you get filters such as sepia, colorize, color correction, color grading, monochrome, etc. You can apply one or more than one filter to a single video. Except for one video filter software, all of these apply filters to the whole video and not a specific part. In these video filter software, you also get all the essential video editing features like transformation (rotation, flip, etc. ), effects, tools (cutter, splitter, merger, etc. ), etc. Editing features further help to fine tune the video. After completion, you can export video in various formats such as MP4, AVI, MOV, MPG, WMV, etc. Video exporting option provides a set of variables before exporting process begins, like video resolution, frame rate, format, output location, etc. HITFILM EXPRESS is my favorite software because it has predefined filters along with options to create custom filters. Its main advantage over other software is that it lets you apply filters over a small part of a video. Support for multiple video formats and availability of handy editing features make it a really useful software. You can also check out lists of best free Photo Filter, Video Editor, and Video Stabilizer software for Windows. HITFILM EXPRESS is a free video filter software for Windows. It is mainly a popular video editor that can also be used to apply filters to videos. In this software, you can edit movies, vlogs, game videos, etc. Plus, it is an ideal software to add effects, sounds, music, etc., to a video. In this software, you basically get two types of filters; one is color filters and other is effects filters. In color filters, you can get every possible shade of color that you can apply to videos. However, effects filters come in various categories such as color correction, color grading, distort, light & flares, etc. All of these filters can be applied to the whole video, or you can even add filters to a particular section of the video. Besides having various features, it is also good at handling videos of various formats like AVI, WMV, MPEG, MP4, MOV, etc. This video filter software provides three main sections that are necessary to edit or add filters to videos. These sections are Tools panel, Editor section, and Viewer. In Tools panel, you get various effects, filters, controls, etc. Editor Section provides a timeline below which you can add multiple videos and effects just by dropping videos to this editor section. It also contains essential tools like drag tool, slice tool, slip tool, ripple edit tool, etc. Here, you also get the option to export videos. The Viewer section is used to view all the changes made on a video in real time. You can play videos like a normal video player and also jump on any section of the video by dragging the slider bar over the timeline. A project settings page will open up from where you can set video resolution, frame rate, audio sample rate, antialiasing, etc. Select these parameters and press start editing button. To add color filters, go to Tools panel > Media > New > Plane. First, select a color filter and drop that filter in the timeline section. Now, you can apply this color filter to a particular section of the video by holding the edges of the filter. This way, you can add different video color filters to different parts of the video. However, for effects filters, go to Tools panel > Effects. To apply effect filters, you need to drop effect filters exactly above the video in the timeline section. But, you will not be able to apply effects filter to a particular section of the video. It will be added to the whole video. Once finished with editing, go to the export tab and press the start exporting button. HITFILM EXPRESS is a feature rich video editing software. Apart from video filters, you can rotate a video, resize a video, and do morevideo editing in it. Note: To download HITFILM EXPRESS, you need to create a HITFILM account. After successful registration, you will get the download link to the registered email account. Shotcut is a free and open source video filter software for Windows. This software provides some basic video editing tools and functions like filters, timeline, etc. As a video filter software, it provides a lot of filters like color grading, blur, chroma key advanced, contrast filter, etc. Plus, to let users view changes in real-time, it provides a dedicated preview window. In this software, you do not have to worry about video formats before editing a video as it supports a good range of input video formats, such as MP4, MOV, AVI, MPEG, WEBM, etc. In this freeware, the whole process of applying filters is pretty easy. You can follow the below steps to add filters to video. First, import video using open file option. The added video will automatically start to play in the preview window. Now, select the filters section from the main toolbar. A filter window will open up at the left side of the interface. Select one or multiple filters to create a mixed filters effects. All the selected filters will automatically apply to videos, which you can check from the preview window. After editing, open the export panel by clicking on the export button. From the export panel, you can choose the output format (AVI, WMV, MP4, etc. ), video resolution, video codecs, audio sample rate, etc. After finalizing output video settings, press the export file button to get the resultant video. Lightworks is another free video filter software for Windows. It comes with various VFX effects and filters that you can easily add to a video. Effects and filters that are present in it are color tint, greyscale, tritone, color correction, etc. The available filters can further be customized in this software by changing filter parameters like color, brightness, opacity, saturation, etc. Besides filters, it has all standard features that you can find in a video editor software, like a set of effects, an editor section, timeline, preview player, and many other settings and sub settings to produce a desired edited video. This video editor or video filter software is also quite popular among professionals because of its simple and intuitive interface. Many popular movies are edited through this software. Lightworks is suitable for small youtube, facebook videos as well as for big 4k movie project. Its ability to handle videos of different video formats (MP4, MKV, AVI, WMV, MOV, etc.) comes in handy. Launch this software and create a new project. It asks you to set the frame rate and name of the project. Do it and press ok.
Add video folder to this software to view all the video files of that folder. Select and drop a video file to the timeline. Now, go to the VFX tab that contains all the filters at the left side of the interface. Select one or more video filters and drop them exactly over the video which is present in the timeline section. You can immediately observe the change in color of videos according to the applied filter from the preview tab. To further fine tune the filter opacity, color intensity, etc., open the settings available in VFX tab and change parameters like color tint, shadows, mid-tones, highlights, saturation, gamma, etc. At last, either preview or export video. To export video, right click on the preview player and select export option. Overall, it is a very good video filter software, but this free version has a major limitation that it only lets you export videos in MP4 format. Note: In order to continue using this free version, you have to register once to their website. VideoPad is a yet another free video filter software for Windows. You can also use it to add filters to video, but it is only free for private use. To use it commercially, you have to buy its paid version. This software provides filters along with many other video effects, such as motion & transform, blending, color correction, artistic, etc. Besides filters, all other necessary editing tools and features are also present in it. Its interface also looks like a typical video editor where you get a timeline at the bottom, a preview window, a file section to add audio and videos, and all tools and sections at the top toolbar. All video filters are available in the video effects section. Another good thing is that it can take all common video files as input. Add a video by going to files > add files. The added video will appear in the video file section. Go to video effects and select filters from the list of filters. To add more effects, use sections like blending, motion & transform, etc. Either preview video or export video by going to export file > video file. At the time of exporting the video, you can change some parameters of video such as video frame rate, resolution, file format, etc. In VideoPad, you can export videos in 16 different video formats such as ASF, AVI, DV, FLV, WMV, MPG, MP4, etc. OpenShot is a free video editing software for Windows. Through this video editor, you can also add filters to video. It comes with seven effects filters named blur, chromakey (green screen), deinterlace, alpha mask, negative, brightness & contrast, and color saturation. Besides filters, some transition effects are also present in it that you can use to provide a smooth transition effect between two joined videos. OpenShot is not as feature-rich software as some other video editors, but it is definitely simpler to use than various popular video editors. It provides basic video editing tools along with the support of various popular video formats, which makes it a quite good video filter and editor software. Some of the video formats that it supports are MP4, AVI, WMV, MOV, etc. When you launch this software, you can view a tool section, edit section, and a video preview section. Tools section contains various effects, filters, and other important video editing tools. Edit section provides a multitrack timeline on which you can drop videos, effects, sound, etc., to make a custom video. As the name implies, video preview section lets you preview the edited video before saving. Now to add filters to video, first, import a video using the file menu. The imported video will add to the project files tab of tools section. Drag and drop the video from project files tab to one of the tracks of the editor section. Now, go to the effects tab of tools section and select one of the effects and drop that effect filter on the video present in the editor tab. As soon as you drop an effect on the video, that effect filter will immediately be applied to the whole timeline of that video. You can view the video with the applied filter in the preview section. In this freeware, you can add more than one filter to a video to give a combined effect of different filters to a video. When finished with video filter editing, either save the whole project as .osp project or export video in one of the supported video formats such as AVI, FLV, MOV, WEBM, etc. At the time of exporting, you can change other parameters of video such as quality, resolution, codecs, start/end frame, etc. Easy Video Maker is yet another free video filter software for Windows. It is also a good video editor software. Using it, you can edit recorded video and also directly record video to this software for quick editing. Plus, all video editing features like multi overlay timeline, effects (transition effects, motion effects, filters), preview window, merge, split, rotate, inbuilt shapes, etc., are available in it. To add filters to video, it has various filters such as greyscale, soften, sharpen, blur, edge detection, etc. Besides predefined filters, it also lets you make custom filters by using settings like colorize, color levels, saturate, jitter, mosaic, etc. Here, you can add one or more than one filters to a video. To add filters to video, firstly, add video to this software and drop the added video to overlay (timeline). 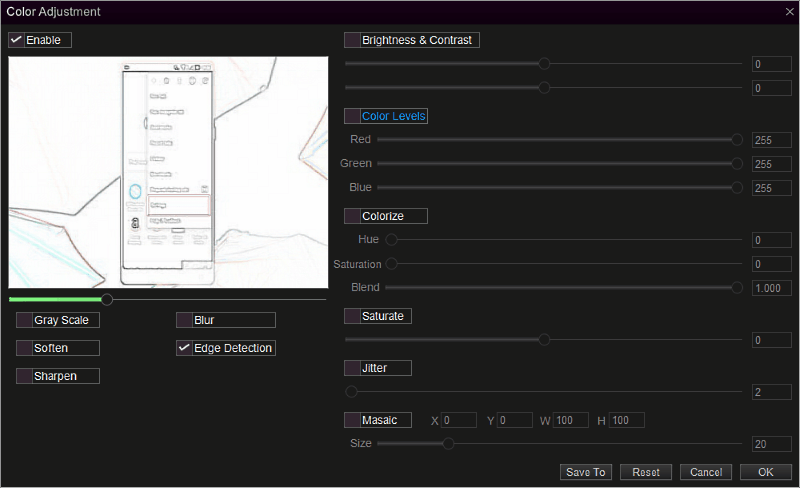 Now to add filters, go to Effects > color adjustments > set overlay to open the filter section. Select predefined filters or make custom filters using available settings. Selected filters will automatically be applied to a video. After that, either preview the video or permanently apply the filter to the video by pressing the ok button. This software also has a separate settings section which is specially used to edit parameters of output video before sending it for rendering. From settings section, you can change video resolution, codecs, output format (MP4, AVI, MOV, MPG, etc. ), video quality, etc. At the end, press the render button to save the output.